The Mosier area lies along the Columbia River in northwestern Wasco County between the cities of Hood River and The Dalles, Oregon. Major water uses in the area are irrigation, municipal supply for the city of Mosier, and domestic supply for rural residents. The primary source of water is groundwater from the Columbia River Basalt Group (CRBG) aquifers that underlie the area. Concerns regarding this supply of water arose in the mid-1970s, when groundwater levels in the orchard tract area began to steadily decline. In the 1980s, the Oregon Water Resources Department (OWRD) conducted a study of the aquifer system, which resulted in delineation of an administrative area where parts of the Pomona and Priest Rapids aquifers were withdrawn from further appropriations for any use other than domestic supply. Despite this action, water levels continued to drop at approximately the same, nearly constant annual rate of about 4 feet per year, resulting in a current total decline of between 150 and 200 feet in many wells with continued downward trends. In 2005, the Mosier Watershed Council and the Wasco Soil and Water Conservation District began a cooperative investigation of the groundwater system with the U.S. Geological Survey. The objectives of the study were to advance the scientific understanding of the hydrology of the basin, to assess the sustainability of the water supply, to evaluate the causes of persistent groundwater-level declines, and to evaluate potential management strategies. An additional U.S. Geological Survey objective was to advance the understanding of CRBG aquifers, which are the primary source of water across a large part of Oregon, Washington, and Idaho. In many areas, significant groundwater level declines have resulted as these aquifers were heavily developed for agricultural, municipal, and domestic water supplies. Three major factors were identified as possible contributors to the water-level declines in the study area: (1) pumping at rates that are not sustainable, (2) well construction practices that have resulted in leakage from aquifers into springs and streams, and (3) reduction in aquifer recharge resulting from long-term climate variations. Historical well construction practices, specifically open, unlined, uncased boreholes that result in cross-connecting (or commingling) multiple aquifers, allow water to flow between these aquifers. Water flowing along the path of least resistance, through commingled boreholes, allows the drainage of aquifers that previously stored water more efficiently. The study area is in the eastern foothills of the Cascade Range in north central Oregon in a transitional zone between the High Cascades to the west and the Columbia Plateau to the east. The 78-square mile (mi2) area is defined by the drainages of three streams—Mosier Creek (51.8 mi2), Rock Creek (13.9 mi2), and Rowena Creek (6.9 mi2)—plus a small area that drains directly to the Columbia River. The three major components of the study are: (1) a 2-year intensive data collection period to augment previous streamflow and groundwater-level measurements, (2) precipitation-runoff modeling of the watersheds to determine the amount of recharge to the aquifer system, and (3) groundwater-flow modeling and analysis to evaluate the cause of groundwater-level declines and to evaluate possible water resource management strategies. Water-level measurements were made in 37 wells. Bi-monthly or quarterly measurements were made in 30 wells, and continuous water-level monitoring instruments were installed in 7 wells. The measurements principally were made to capture the seasonal patterns in the groundwater system, and to augment the available long-term record. Groundwater pumping was measured, reported, or estimated from irrigation, municipal and domestic wells. Flowmeters were installed on 74 percent of all high‑capacity irrigation wells in the study area. Borehole geophysical data were collected from a known commingling well. These data measured geologic properties and vertical flow through the well. Streamflow measurements were made in Rock, Rowena, and Mosier Creeks. A long-term recording stream‑gaging station was reestablished on Mosier Creek to provide a continuous record of streamflow. Streamflow measurements also were made along the creeks periodically to evaluate seasonal patterns of exchange between streams and the groundwater system. Annual average precipitation ranges from 20 to 54 inches across the study area with an average value of about 30 inches. Based on rainfall-runoff modeling, about one‑third of this water infiltrates into the aquifer system. Currently, about 3 percent of the water infiltrated into the groundwater system is extracted for municipal, agricultural, and rural residential use. The remainder of the water flows through the aquifer system, discharging into local streams and the Columbia River. About 80 percent of recent pumping supports crop production. The city of Mosier public supply wells account for about 10 percent of total pumping, with the remaining 10 percent being pumped from the private wells of rural residents. Groundwater-flow simulation results indicate that leakage through commingling wells is a significant and likely the dominant cause of water level declines. Leakage patterns can be complex, but most of the leaked water likely flows out the CRBG aquifer system through very permeable sediments into Mosier Creek and its tributary streams in the OWRD administrative area. Model-derived estimates attribute 80–90 percent of the declines to commingling, with pumping accounting for the remaining 10–20 percent. Although decadal trends in precipitation have occurred, associated changes in aquifer recharge are likely not a significant contributor to the current water level declines. As many as 150 wells might be commingling. To evaluate whether or not the local combination of geology and well construction have resulted in aquifer commingling at a particular well, the well needs to be tested by measuring intraborehole flow. During geophysical testing of one known commingling well, the flow rate through the well between aquifers ranged between 70 and 135 gallons per minute (11–22 percent of total annual pumping in the study area). Historically, when aquifer water levels were 150–200 feet higher, this flow rate would have been correspondingly higher. Because aquifer commingling through well boreholes is likely the dominant cause of aquifer declines, flow simulations were conducted to evaluate the benefit of repairing wells in specified locations and the benefit of recharging aquifers using diverted flow from study area creeks. As part of this analysis, maps were generated that show which areas are more vulnerable to commingling. These maps indicate that the value of repairing wells in the area generally coincident with the OWRD administrative area is higher than in areas farther upstream in the watershed. Simulation results also indicate that artificial recharge of the aquifers using diverted creek water will not significantly improve water levels in the aquifer system unless at least some commingling wells are repaired first. Repairs would entail construction of wells in a manner that prevents commingling of multiple aquifers. The value of artificially recharging the aquifers improves as more wells are repaired because the aquifer system more efficiently stores water. 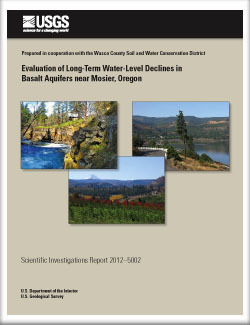 Burns, E.R., Morgan, D.S., Lee, K.K., Haynes, J.V., and Conlon, T.D., 2012, Evaluation of long-term water-level declines in basalt aquifers near Mosier, Oregon: U.S. Geological Survey Scientific Investigations Report 2012–5002, 134 p.